For one thing Oscar Isaac's (Robin Hood, Drive) Nathan is a bear of a man, a hard-drinking exercise nut, a towering intellect and an emotionally stunted man-child with a God-complex. Rising star Alicia Vikander (Testament of Youth, A Royal Affair) is CGI'd into android form, her face on an I,Robot body and limbs of transparent mesh. Former dancer Viaknder pulls off a superb physical performance, somewhere between machine and puppet, while Ava's personality is playful, flirtatious, calculating, play-acting and ultimately unknowable; the script gives very little insight whether Nathan's creation is Little Orphan Annie or Hal9000. Domnal Gleeson's (Anna Karenina, Calvary) Caleb is a gangly, ginger bundle of pauses and stammers and shy smiles, desperate not to give offence, but concealing hidden depths. In this theatre of mutual distrust, the mystery-thriller format plays out, gradually revealing the characters' motivations in a polished morality tale that harks back to classic 50's sci-fi novels and, of course, dystopian Twilight Zone episodes. Caleb's Turing Test is a familiar sci-fi trope; a human and a machine hold a blind conversation and if the human can't tell if they're talking to another human or to a machine, the machine has passed the test. Nathan subverts the blind test, revealing the AI as an attractive humanoid robot - shades of the glittering Maria from Metropolis - with complex motivations. It is clear from the outset that Nathan and Caleb don't like each other at all, stoner genius CEO versus middle-ranking corporate programmer. Socially awkward Caleb is immediately drawn to the startlingly direct Ava, like an Android version of Miranda from The Tempest. And the obsessive, superior Nathan clearly takes delight in the mind games he plays with both of them, or with anyone, given the strange behaviour of Nathan's inscrutable Japanese maid, Kyoko (Sonoya Mizuno). Nathan is the kind of privileged ego-maniac who enjoys the master-slave relationship anyone in his company. You can ignore the sci-fi MacGuffins; Ava's quantum-computing, liquid brain, the neural-network wet-ware built from the sum of humanity's Internet searches, the Big Brother surveillance house. Garland (The Beach, Sunshine, Dredd) knows his sci-fi very well, from 2001 to Demon Seed, every version of Frankenstein and all points right up to Transcendance and Inception. Garland creates a stiflingly uncomfortable atmosphere of paranoia in Nathan's expensive and quite hideous designer bunker from what is essentially the triangular relationship of Caleb, Nathan and Ava. Can Caleb's contaminated Turing Test possibly prove Ava's sentience? And if so, what kind of sentient being is she? While Nathan wants to play God, Ava clearly wants to be free, and, knowing she is watched at all times, deliberately plays to her audience. So what does Caleb want, when he already knows Ava isn't human? 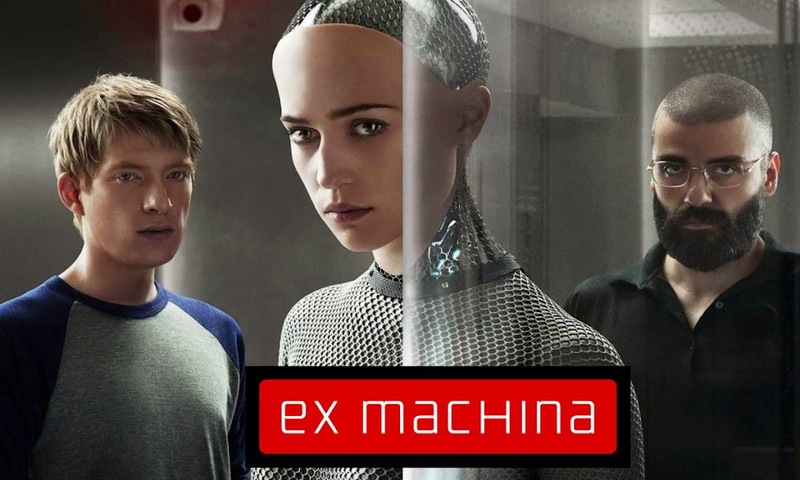 Ex Machina (from the Greek Deus Ex Machina - A God from the Machine - a stage term, but an interesting science premise if you take it literally) is a chilly, intellectual movie that succeeds precisely where Transcendence fails.